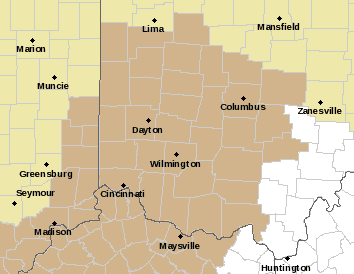 The National Weather Service has already issued a Wind Advisory in the light brown area. The tan area, above, is a hazardous weather outlook warning of high winds. I would not be surprised if the entire map is under a Wind Advisory for tonight... if not a High Wind Watch/Warning. We are expecting some strong to severe storms later today, but strong to severe showers would be a more appropriate title. We will not have a lot of lightning with the system on the way, but that will not hinder the storms. As expected, the Storm Prediction Center moved the Slight Risk for severe weather further north. Called that in my last blog entry. The main threat will be strong winds. The winds this afternoon, evening, and overnight will pick up to around 30 mph with gusts pushing 45 mph. This is ahead of the rain... so the winds in the storms will be even stronger. The FutureRadar is showing some late afternoon showers. The above image is for 4PM. Notice the green pushing into Ohio. Just some moderate rain for the late afternoon with the strong winds. The above image shows 9PM. Notice the strong line starting to for in Indiana. That line will continue pushing toward Ohio. Here is a more resolute image for 9PM. This shows the line a little more broken. That is actually bad news for Indiana. There is a slim chance for tornadic cells because there will be a decent amount of low level wind shear, or change in direction of winds in the lower atmosphere. Above is the 8AM weather balloon sent up from the NWS office in Wilmington, Oh. Notice the surface winds are coming out of the south, but by the time you get up a few kilometers the winds are starting to almost go westerly. This will be even more pronounced later tonight. If a cell becomes strong enough and takes on the traits of the atmosphere's turn in direction then you likely can get a rotating updraft and possibly lead toward a tornado. This would be more pronounced over Indiana, but Ohio is very marginally under the risk. By around 1AM the strong line will be moving through Central Ohio. Maybe a lingering shower or two early Friday, and later Saturday, but the main concern is the winds for tonight. I would tie down any loose items outside now. Again, we are only under the Slight Risk, but still take it seriously. So just to break it down... between now and the early afternoon we will remain generally dry in Central Ohio. The late afternoon a few passing showers with some gusty winds 30+ mph. We have some dry pockets for trick or treat time, but still remaining windy. More stronger showers/storms expected before and just after midnight with the strongest winds of the night. Rain pushes to the east in the middle of the night and the winds stay brisk for early Friday. The good news is that with winds as strong as they will be... no need to rake the leaves today. Haha. Always gotta look at the good side of things. If any big changes come up, I will let you know. Have a good one!